Check out ideas about promoting helmet use and bike safety in your community, tips for bikers and parents, activities for kids and more. One of the smartest things you can do to stay safe while biking is to wear a helmet. Head injuries account for two-thirds of bicycle-related deaths and one-third of non-fatal injuries. 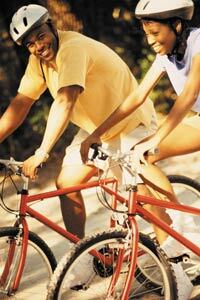 Bike helmets can reduce the risk of head injury by as much as 85%. So buckle it on and bike safe! The Minnesota Safety Council is a private, not-for-profit organization which has been dedicated to making Minnesota safer since 1928. Contact the Minnesota Safety Council at msc@minnesotasafetycouncil.org, or 651-291-9150/1-800-444-9150.